Wobeck Crane Services offer bespoke and unique crane lifting services utilising their specialist spider cranes which are more adaptable than conventional lorry mounted, wheel based cranes and often just as capable in providing the solution to your lifting requirements. 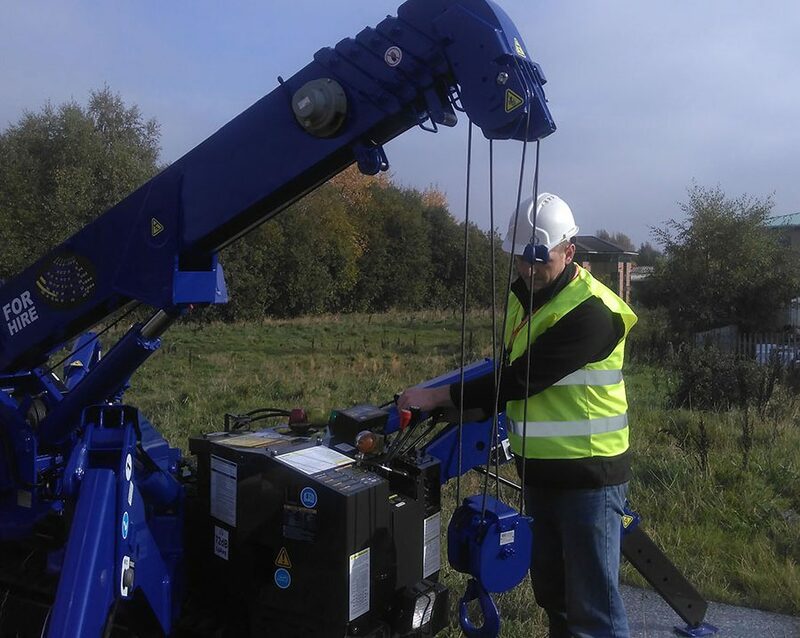 Whether you need glass panels lifting into position, steels for building works, cookers and ovens lifting through tight spaces, hot tubs lifting on to decking or simply can’t accommodate a large crane on site but still need a heavy item, or items lifting into position, a spider crane could be exactly what’s needed. Our crane’s size and rubberised tracks mean it can go many places a standard crane can’t or would damage if it tried, making it suitable for many surfaces and uses. From protecting sensitive surfaces such as cobbles, traversing soft and uneven ground or passing through conventional doorways to operate indoors our crane is incredibly versatile. It can even be lifted by other cranes to work on the top of buildings! It’s delivered and leaves site on a plant trailer so there’s not even a large truck to accommodate on your site when space is at a premium. Our spider cranes aren’t short on lifting power…. small can still be powerful! The maximum lifting height of our smallest crane is 8.8m (9.8m with fly jib and 10.47m with fixed hook) – and that’s tall! It can lift up to 2.9 tonnes – and that’s heavy! The boom length of our smallest crane ranges between 2.53m and 8.65m – and can therefore be short or long depending on what you need! When you deal with Wobeck Crane Services you deal directly with the directors and specialists who will be organising and undertaking your lift. Run by Nick, Jonny and Joe with the key support of our Appointed Person, Craig, you are dealing with a dynamic team who are not only enthusiastic about our unique spider cranes and their capabilities but who are also interested in your project and how we can best support your lifting requirements. members having worked together for over 10 years. Since they are a small team you also get a personalised service resulting in a high level of customer satisfaction and positive feedback. Nick, Jonny and Joe all have experience of delivering cranes on projects of all scales and Joe likes to be hands on too, even operating the crane on site to meet client’s lifting needs if required. To ensure the company meets, and surpasses current health and safety requirements, Craig acts as an Appointed Person, preparing and conducting Lift Plans to ensure that the crane lift not only meets the client needs, but that the lift is also carried out as safely as possible. The team are always happy to discuss your lifting requirements, work out bespoke, competitive costs for projects or just to discuss how we can help with your lift. Give the team a call and they’ll be happy to have a chat about our spider cranes or send them an email and they’ll get back in touch.